The creator of competitive classic marathon rallying, Philip Young is unfortunately no more. He died at the age of 67 in a hospital in Bangkok on March 11 this year, due to complications from a head injury he suffered in a motorcycle accident in Burma (Myanmar) at the Road to Mandalay Rally. 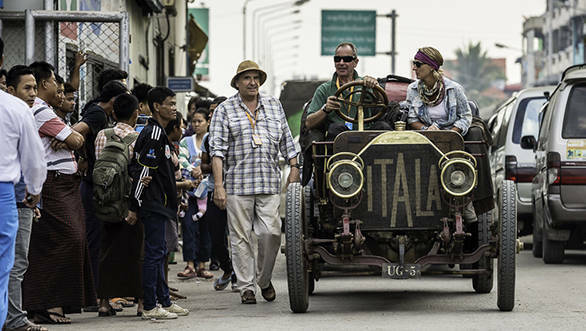 Ironically, this event will be remembered as Philip's final milestone because once again, in his inimitable manner, he had managed to get permission for the 70 rally cars to become the first to cross the land border from Thailand into Burma. Not many people know that Philip Young had a strong connection with India. One of Philip's first rallies as a competitor was the 1977 London-Sydney Marathon. Sadly he had to drop out at Madras (now Chennai) when he missed the ferry to Australia. Interestingly, Philip participated in a BMC 1100 purchased from a scrapyard for some 50 pounds. He then prepared the car that some called the Scrapyard Special - it was amazing that he managed to drive it from London to Madras. Some years later, Philip Young also authored a book How to Build a Low-Cost Rally Car. This book too has an India connect. The cover shot is of Philip at the 1985 Himalayan Rally with his broken down Skoda Estelle surrounded by curious villagers. Philip Young participated in the inaugural Himalayan Rally, which was flagged off from Bombay (now Mumbai) in 1980. You had drivers like Shekar Mehta and Achim Warmbold and also factory prepared Opels, Toyotas, Datsuns etc. But Philip grabbed the attention because, as was typical of him, he entered a 1967 Morris Minor he had borrowed from the Archbishop of Canterbury! He finished the event in a most impressive tenth place overall and at the prize distribution ceremony, even attempted to kiss the then Prime Minister Indira Gandhi's hand, only to be stopped by her bodyguards. A photograph of his Morris Minor being lifted and carried out of a river by bare backed villagers got printed in many publications all over the world and can be found even today on the net. Philip later came out with a coffee table book The Himalayan Minor and Nazir Hoosein (the organiser of the Himalayan Rally) shared his personal copy with me. Scale model makers, Corgi too made a 1:43 model of the Himalayan Minor. The next year, Philip participated in the Himalayan Rally in a red ex-works Austin-Healey 3000 and when I met him at the scrutiny at the bus depot at Cuffe Parade in Mumbai, he was very nice and even let me sit inside the car. Philip put in a very impressive drive and though he was in a car that was over 20 years old, he led the 1981 rally and outpaced the factory prepared modern rally cars. But then on a rough sector up in the hills of Uttar Pradesh, he hit a bad rut and broke the chassis, which put him out of the event. Philip Young who was editing and publishing his own motoring magazine, Sporting Cars in the 80s, came back in 1983 in a Triumph TR7 V8 with pop-up headlights. As in the earlier Himalayans, he was sponsored by Unipart, an auto component company owned by Leyland. Philip again drove very well and was running a strong third on the Roof of the World, when the axle broke just hours from the finish. I don't quite remember what car Philip drove in the 1984 Himalayan or even if he took part, but as mentioned earlier, he came in a Skoda Estelle in 1985. In 1986, which was Philip's last Himalayan, he drove a Rover SD1 for the Unipart Rally Team and I still have the rally jacket given to me by Asif Haidery, who was part of his service team. Some of the cars that Philip drove in the Himalayan Rally are now on display at the Heritage Motor Museum at Gaydon, UK. Philip Young truly enjoyed driving old classic cars in competitive events and the Himalayan Rally and our country clearly played an important part in enhancing this passion. In 1988, Philip organised the Pirelli Classic Marathon from London to the Alps and back. BBC made a documentary called The Great Chase which was shown in over 70 different countries. Philip had put classic rallying well and truly on the world map and in 2013, Octane magazine honoured Philip Young with the Personal Achievement Award in 2013, 'for inventing historic rallying'. In 1997, Philip organised the Peking to Paris Rally and I remember meeting him on the Nepal-India border on September 24, 1997. He was opening the route for the 100 plus participating classic cars in a rally-prepared Peugeot 504. That night we had a drink together at the overnight halt in Nainital and I remember suggesting to him, "Tomorrow why don't you put a time control outside Jim Corbett's house in Kala Dungi ." He was not aware that the great hunter, conservationist and author Corbett, who loved India, used to move there in the winters and that his house that was en route, was now a museum. Next day when we came to Kala Dungi I saw a passage control, right outside my hero Jim Corbett's house. That was Philip Young, a true adventurer and organiser par excellence. Rest in peace, you champion of classic cars and lover of the Himalayan Rally.